A landing page is the crown jewel when it comes to grabbing user attention and pushing people through your sales funnel to bring in more revenue. The idea behind a landing page is to clear out all other distractions to put the focus on what you’re selling. 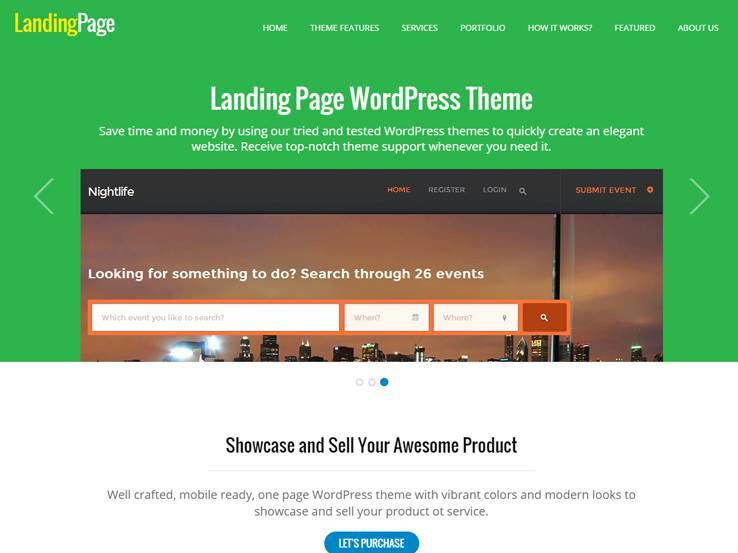 And you can accomplish that easier with landing page WordPress themes. Using a landing page means you have your visitor’s attention and they can keep learning and reading about what you plan on selling and how it’s going to benefit them. What’s Included on a Landing Page? Landing pages are meant to contain long-form content, since it has been proven that a long page with tons of content is the ideal way to make a sale. You can incorporate several buttons, calls to action, signup forms, explanations on how the product or service is going to benefit the user, and images to push people along the way. Regardless of what you’re selling on your landing page, you need a landing page theme to quickly design the site and start collecting email addresses or making sales. That’s why we put together a list of the best WordPress themes to cut down on the time it takes you to find the right one for your product or service. 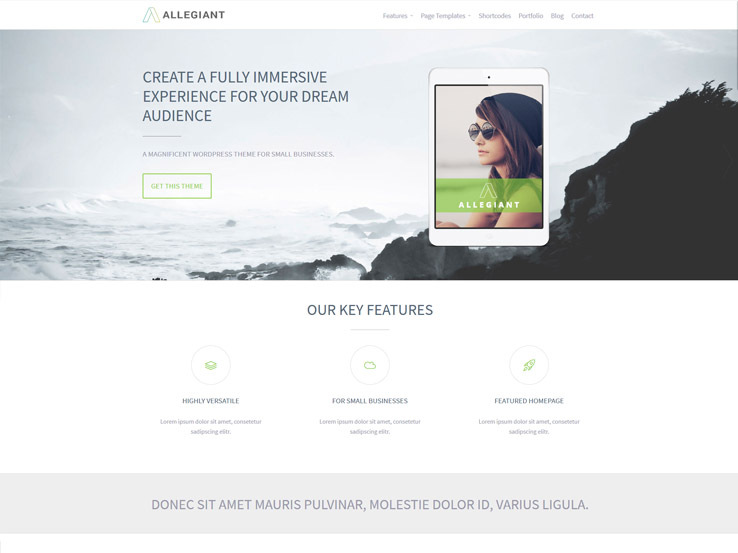 The Allegiant theme is a great option for building landing pages. It has a clean and professional design, along with an impressive set of features that can help boost your sales and conversions. To start with, the template includes an elegant slider that you can use to introduce your product or service, complete with images and buttons to lead people to your sales section. You can include your team members to add some form of personalization, and testimonials with client logos for the ultimate social proof; all these will help boost your conversions and sales. We like that the template is fully responsive, since most of your visitors will come from mobile devices. Besides, you can customize your page layout completely, and you’ll find shortcodes to easily add design elements such as buttons, columns, pricing tables, accordions, and more. 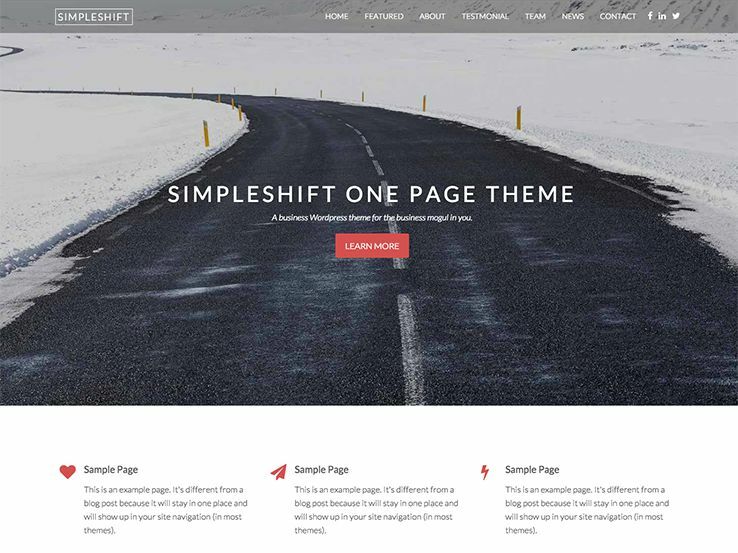 If you’re interested in building a landing page, but would also like a theme that can serve as a one-page website, the Simpleshift solution is the best bet for you. This gem comes from the folks at ThemeShift and it provides a beautiful responsive layout that looks great no matter which device your visitors are using. In fact, since this is a completely one page website, you don’t even have to worry about finding a specific post or page format. The one-page setup is great for landing pages because it has several pre-built sections for adding text, buttons, call to actions, and even information about the people who work at your company. If you have a product to sell you can highlight the information in a column form, along with icons and other visual elements that are proven to boost conversions. The contact form stands out on your page since it sits on top of a parallax background, directing user eyes to that area and allowing them to get in touch with you if they have any questions. Since this is a one-page theme, most of the content is organized with the help of pre-built sections which are easily customizable on the backend to work with your existing brand. You can easily feature your employees, along with social media buttons and paragraphs to highlight their position or to include a short bio. This is a wonderful way to add some personalization to your landing page. Testimonials are an essential part of a landing page. They can help you boost conversions and are known to build social proof. Since the whole point of a landing page is to get more sales, this is a huge benefit. If you’re planning on getting people to share your landing page, the social media buttons come into play. You can have multiple calls to action, along with icons that highlight your services or products as well as spot for showing off your most recent blog posts. A landing page is supposed to grab attention and immediately convince someone that they should keep reading or buy from your company. If the effect doesn’t take right from the start, that’s where the landing page gets even stronger. It provides a long, detailed explanation of your product or a service to maximize the chances of people buying it. 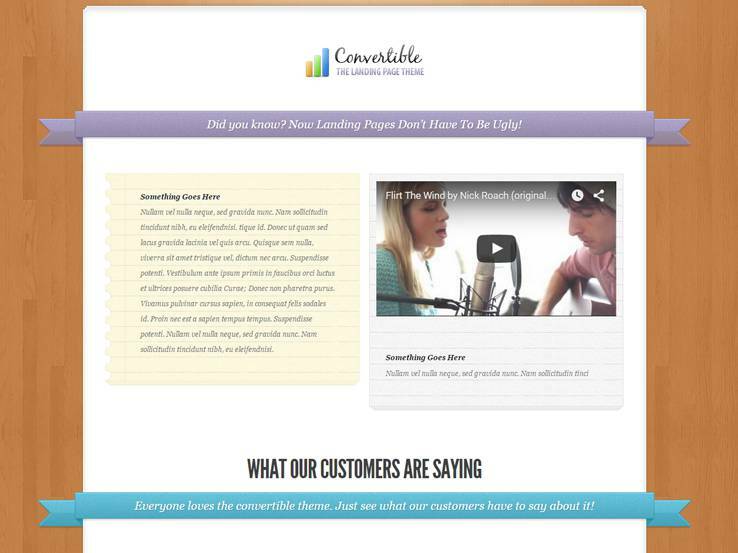 The Simple One-Page Theme has all the tools you need to increase your conversion rates and boost your sales. The header area of the theme is a stunning parallax image which lets you include a text overlay and a button which not only explains what is the main benefit of your product or a service but it also drives people to your sales section. This is where they can read more about what you have to offer and make the final buying decision. That’s not all, though, because a landing page has some benefits when you incorporate a navigation menu. The Simple One Page Theme includes a full menu which sends people directly to certain bits of content by using a one-page scrolling effect. This means your users can immediately get to the section of the website that interests them the most, be that your team members or the testimonials. The theme also includes various shortcodes so that your landing page creation is as quick and simple as possible. When it comes to landing pages, the Simple One Page Theme should be at the top of your list. 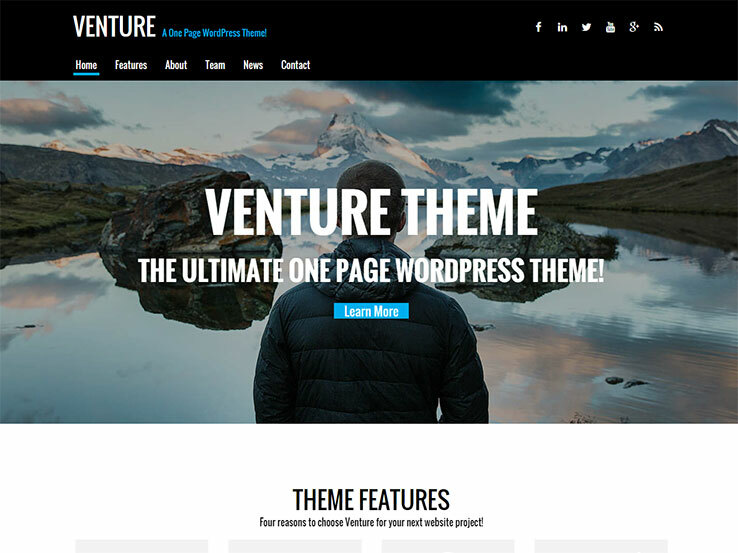 The Venture Landing theme includes a wide set of features that are ideal for creating a landing page to represent your business or personal brand in an organized fashion. As with many effective landing pages, a parallax effect is noticeable from the very start. Overlaying text and buttons help you send people to the most important information and a beautiful navigation menu drives people to one of the nine sections that you can organize throughout your homepage. The majority of your content is located on one page which is a huge advantage, considering people can quickly go to testimonials or to a module that links to your social media buttons. Use the header area to quickly generate interest for your product in the header area and include more details in one of the sections where you can use icons and different colors that match the brand of your company. Use the option to include several calls to action in your sections to make it easy for your visitors to buy your product. The About Us section is manipulated with shortcodes which let you add columns and buttons. You can even feature your team members, linking to their social media accounts and showing their profile photo. One of our favorite parts of the Venture Landing theme is the Recent Articles section, which puts some of your latest blog posts in a preview format. This helps boost your search engine rankings and makes it easier for people to access additional information about your business. One thing you’ll notice is that one-page WordPress themes often work spectacularly well when trying to design a landing page. They have so many similar elements and the overall structure is enough to make plenty of people choose a theme like Ember. 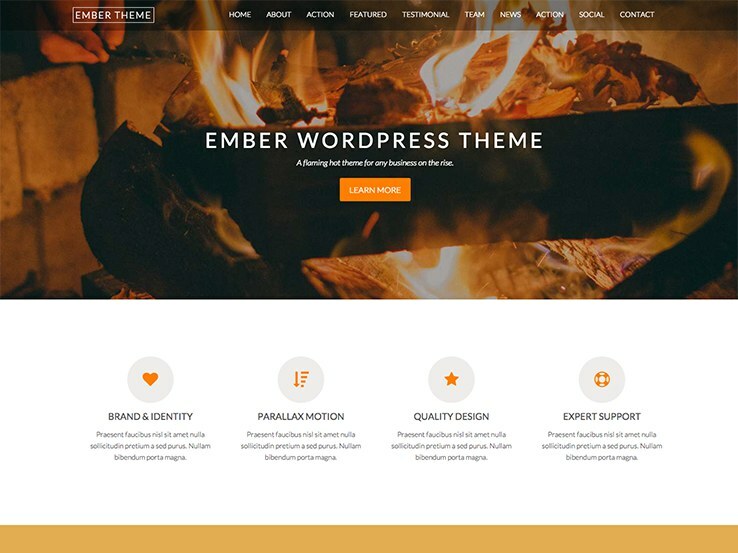 In short, the Ember WordPress theme has several sets of sections, all setup on a single page. You can include items like call-to-action statements, buttons, parallax effects, and recent post links, all on the same page. This helps out companies that are really looking to consolidate most of the information on a single page and it’s also known to increase your conversion rates. The Ember theme has quite a few unique features such as the header row which is built with parallax features and a spot to include buttons. This is a great place to include a Buy Now button and the parallax effect won’t slow down your website. The parallax backgrounds are included throughout the entire homepage which makes certain sections on your website stand out more. A “Meet the Team” area allows you to add a human touch to your company by featuring your employees or coworkers. After all, customers don’t buy from companies, they buy from people. This is what makes this particular feature a must-have on your landing page. This section has spots for uploading images of your employees and you can even link to their social media profiles which helps increase the awareness of your brand. 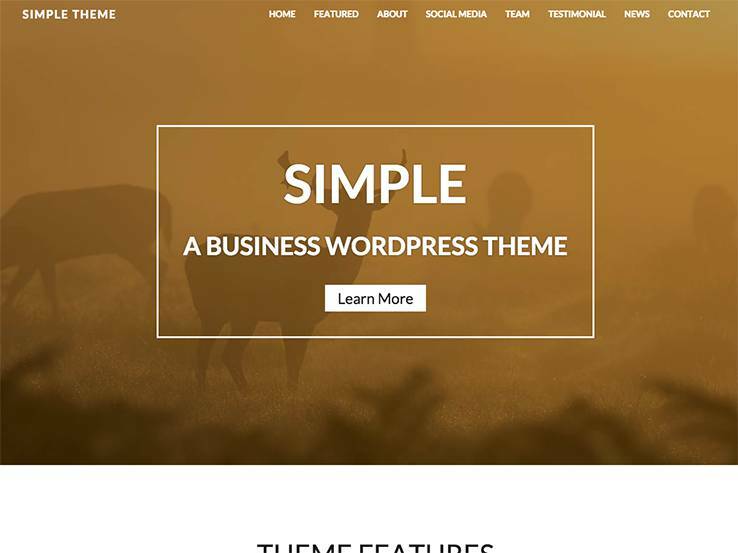 The Simple Business for WordPress theme works wonders as a landing page since it provides plenty of white space and a beautiful slider at the top of the page for highlighting some of your best features and services. This theme offers a multiple page layout as well as a template for a landing page which allows you to add call-to-action buttons and beautiful social media icons. Highlight what your company has to offer and describe your services or products in full, along with icons that come from the FontAwesome icon set. Feature members of your team with ease and use the Latest Articles section to include a snippet of your blog posts. A contact module is provided as well, but one of our favorite parts of the Simple Business for WordPress theme is its simplicity. From the header area to the bottom footer, all of the images are structured in clean formats and your content is put in the front and center with lots of clean elements and icons. 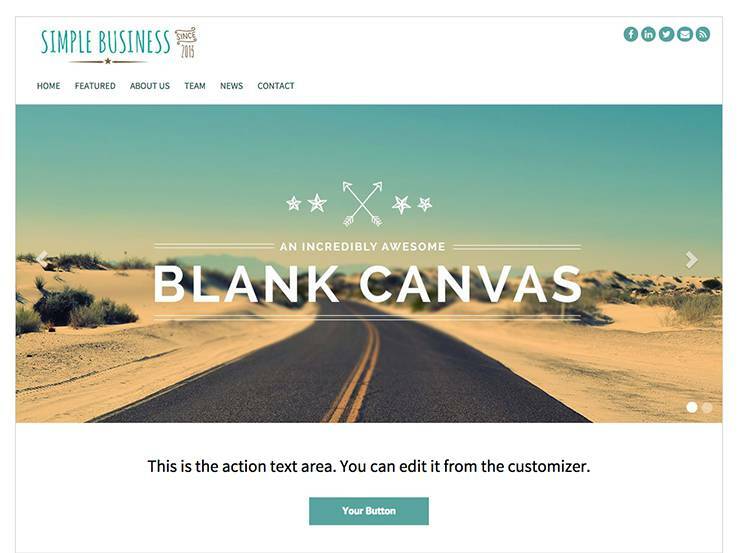 Hundreds of fonts choices are included with your purchase of the Simple Business for WordPress theme as well as unlimited color options which allow you to further customize your website and incorporate your brand. Check out the Lara Multi-Purpose Landing Page theme if you’re interested in a one-page layout with tons of possibilities. Straight from the Nimbus Themes library, you won’t be disappointed when trying to create a beautiful website since the Lara Multi-Purpose Landing Page theme has various tools such as shortcodes and a quick logo upload for customizing your site and creating an organized layout. A notable feature is the blog feed that sits on your homepage. It highlights your most recent articles along with stunning featured images to draw the attention of your visitors. You can also use up to six different blog layouts, adding to the variety that one would expect to find on a landing page. 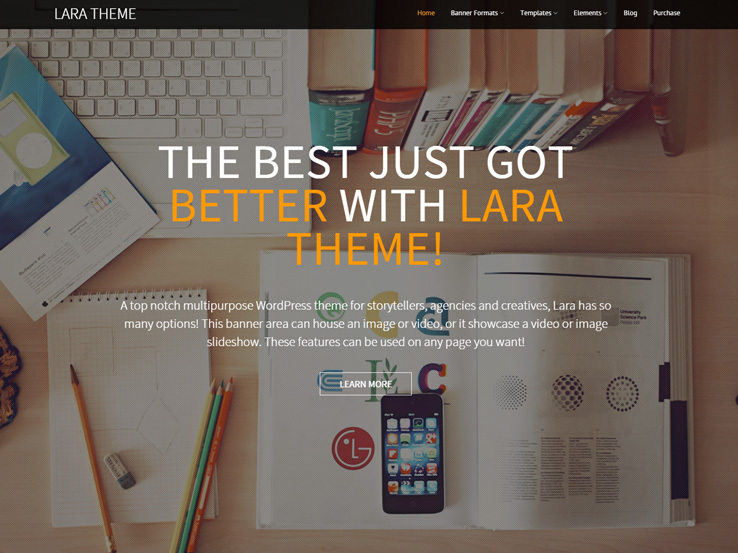 The blog is the only area that requires multiple pages since the rest of the Lara Multi-Purpose Landing Page theme is built with sections on the homepage. Along with beautiful social media buttons, several sections stand out when it comes to boosting your sales. The contact form is useful for keeping in touch with your customers and the Team section allows you to add pictures, descriptions, and job titles of your employees, partners or coworkers. 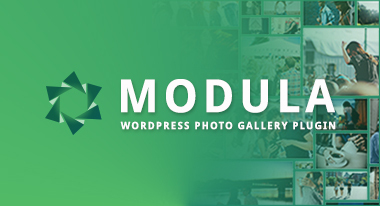 Feature your best photos in an image gallery or use this module to showcase your portfolio. The testimonials are generally the most important items when attempting to sell something through a landing page. That’s why you can instantly share your testimonials in a clean format, with images and quotes from people who have worked with you in the past. Divi by Elegant Themes is the ideal solution if you’d like to make just about anything in terms of a website. Portfolio, business, and eCommerce layouts are all available with Divi, but you can also implement a nice landing page with the help of one of the many prebuilt layouts. 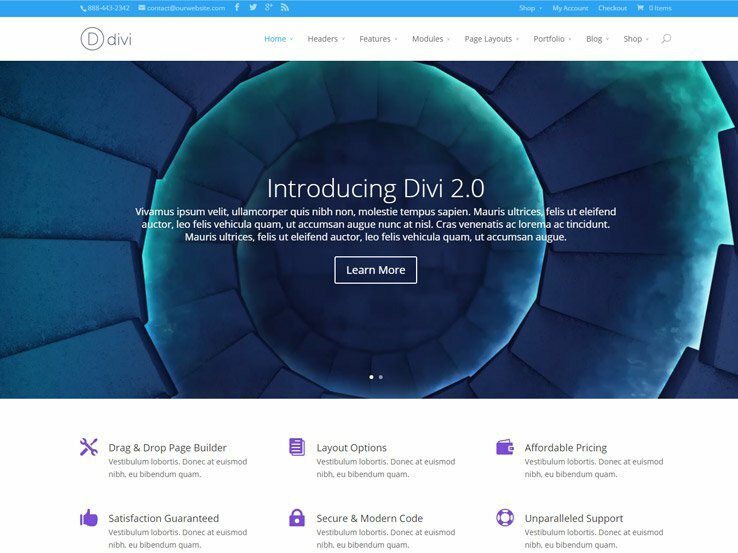 The Divi Theme is powered by the Divi Builder, which is a drag-and-drop editor. The editor is perfect for those who don’t have any development experience since you can simply drag and drop design elements on your pages instead of coding them yourself. Some of these Divi Modules include sliders, contact forms, pricing tables, testimonials, portfolios, and blogs. Many of these work rather well for landing pages and you can design the pages within a few seconds. The Divi theme also includes over 18 premade layouts so that you can make landing pages for your clients or generate your own landing pages for one or two websites you run by yourself. 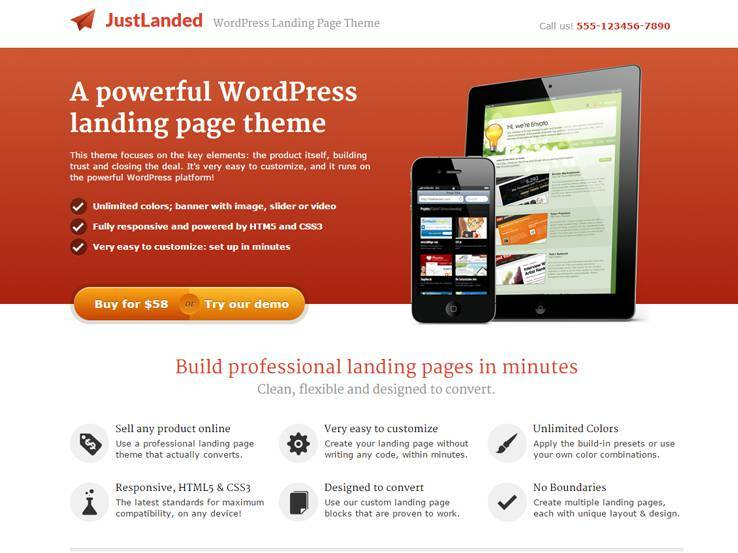 Just Landed is the number one landing page theme on Themeforest, and the reviews are off the charts. The fully responsive theme includes unlimited colors and presets to customize your site as well as plenty of other customization options. Over 500 Google Web Fonts ensure that your text looks unique and the powerful admin panel helps you keep your hands out of the source code. 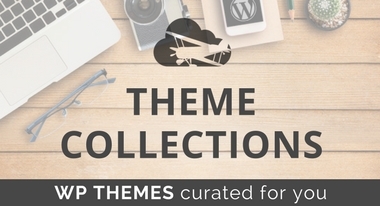 The Just Landed theme includes various shortcodes for adding elements like buttons and columns and you can integrate the theme with MailChimp and Aweber to start collecting email addresses for selling future products. Fully layered PSD files are included with your purchase which is great for developers who want to customize the theme a little further. On top of that, the theme comes with demo content so you never have to start your design process from a blank slate. 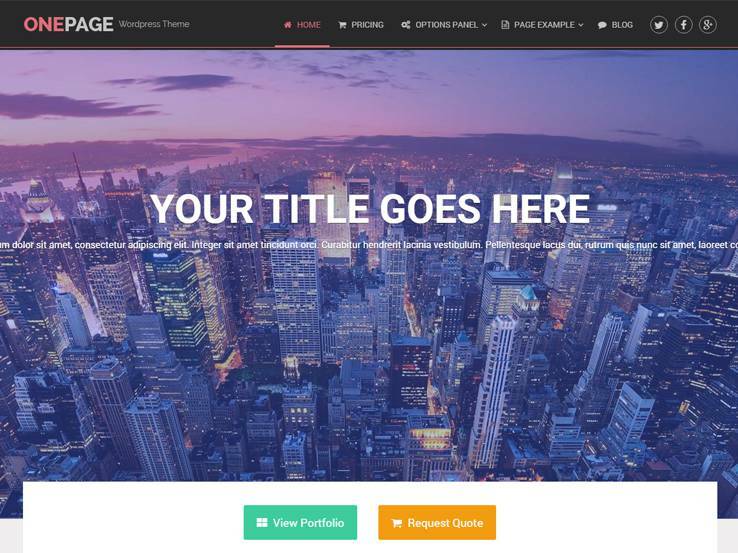 OnePage by MyThemeShop is a creative one-page theme that allows you to create stunning landing pages to sell your products. The drag-and-drop homepage is a notable feature since you don’t need a development degree to build a professional looking website. The AJAX loading ensures that your website is running fast and the ability to disable or enable any section on your landing page allows you to include the most relevant information. 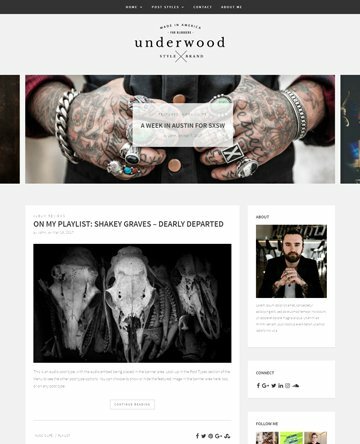 The portfolio post type works wonders for agencies that need to show off past work and the unique blog layouts ensure that your blog looks unique and beautiful as the rest of your website. With SEO optimization and coding capabilities, you can’t go wrong with the OnePage theme from MyThemeShop. The Idea Landing Page theme is a great choice for any business since it has a responsive design as well as a responsive swipe slider, both of which are great features for visitors on mobile devices. Choose from 16 different color schemes to customize your website and use the built-in search engine optimization features to move your site up in the rankings. 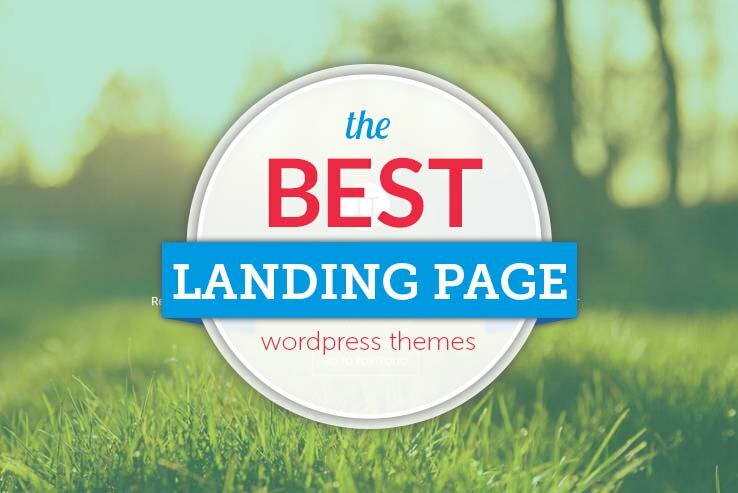 Several included modules ensure that your landing page is the best it can be. You can implement various modules to show things like main features, latest projects, a logo slider or even a simple content block. 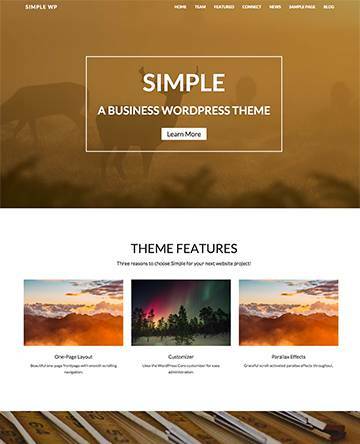 This is one of the more vibrant themes, so if you’d like to grab the user attention from the get-go, take a look at the Idea Landing Page theme by Mojo Themes. 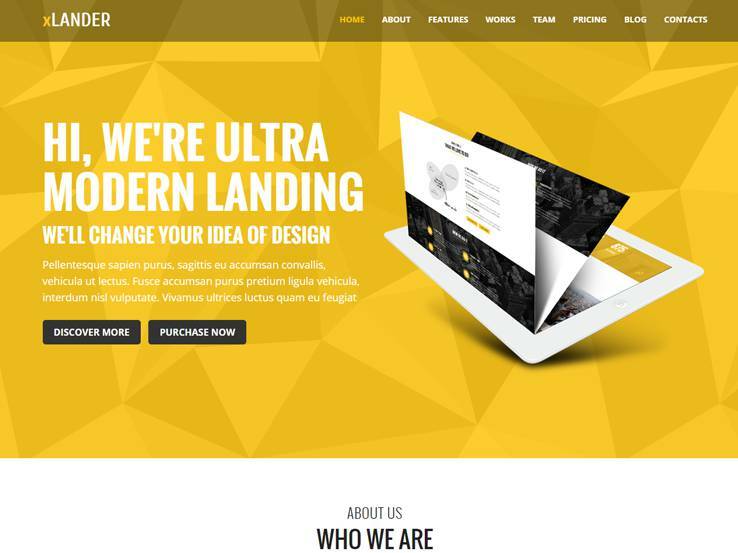 The Landlr theme is an all-in-one landing page theme, designed primarily for companies looking to launch applications and web projects. The flat and modern design is based on Bootstrap 3 for a fast and intuitive interface. The Slider Revolution plugin is included which is a great way to showcase your product. Shortcodes are included with your purchase of the Landlr theme, which means that you can implement items like buttons and columns without any coding knowledge. The full localization support means that you can easily translate your site to another language. Select from four color schemes, browse through the various FontAwesome icons, and use the integrated contact form to allow potential customers to get in touch with you. 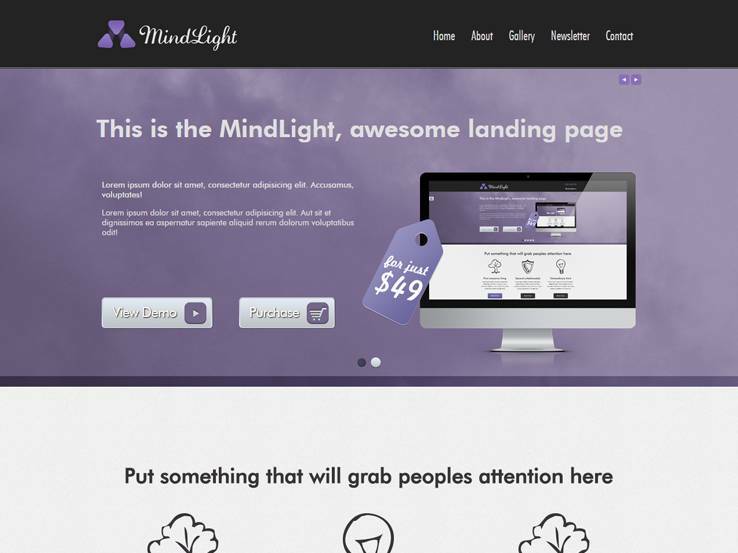 MindLight by Mojo Themes offers a fully responsive landing page layout, with a responsive swipe slider and five color schemes. The responsive slider is a unique feature since it’s not always easy for users to flip through a slider while on phones or tablets. The parallax scrolling is a great way to grab the attention of your visitors and allows you to present your images in a fun way. The built-in SEO plugin enables you to boost your search engine rankings. In terms of design, the MindLight theme has a full gallery to display photos that represent your company. The integrated email subscription form helps you grow your email list and stay in touch with both past and new customers. The xLander theme is a great choice if you’d like an appealing and modern look for selling products through a landing page. The ultra modern design is built on Bootstrap and it offers a responsive layout which looks and works great on all devices. The Visual Composer plugin is included with your purchase and this means that you can quickly design your pages without having to touch any of the source code. A MailChimp plugin also comes with the theme which is a must if you plan on growing your email list and building your customer base. 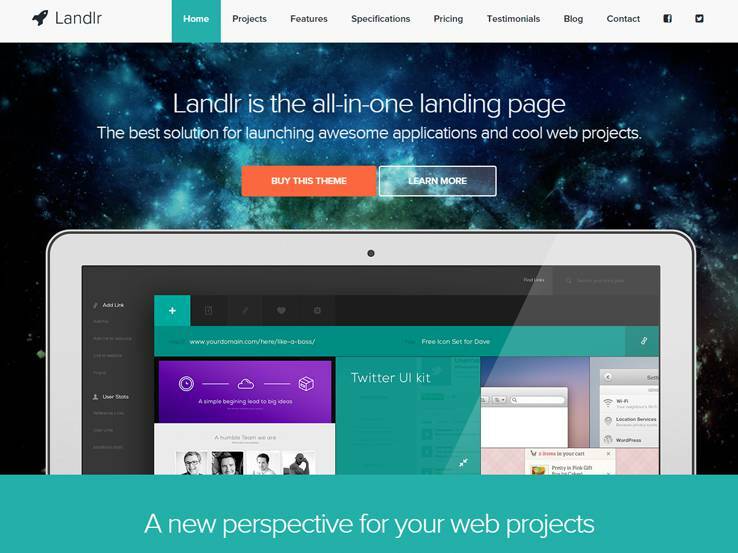 The xLander provides localization tools so you can easily translate your website. 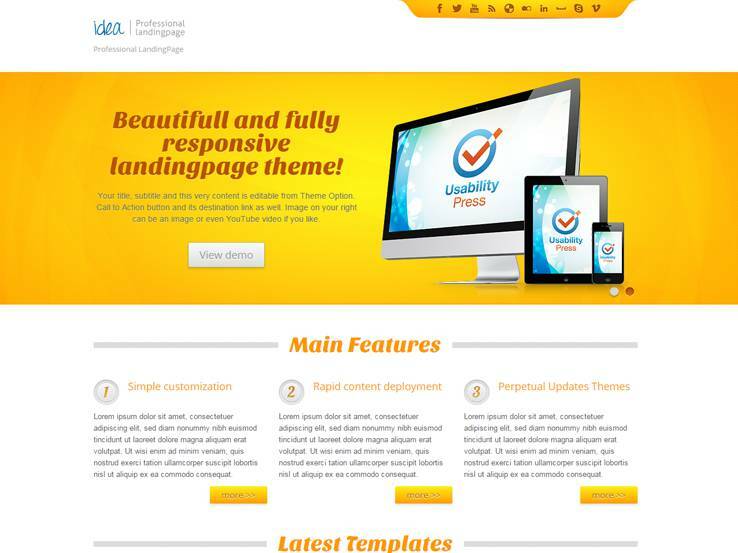 Six different layouts are provided with the theme which provide a great starting point for your design. Convertible by Elegant Themes is one of the simplest landing pages on this list, yet it offers a classic sales page feel. The custom drag-and-drop page builder is easy to use for both beginners and advanced users alike and the unlimited color options ensure that you don’t need to custom code your preferred color scheme. Easily add buttons on your landing page to send people to the right sales outlets and style your lists with icons for the ultimate sales pitch. 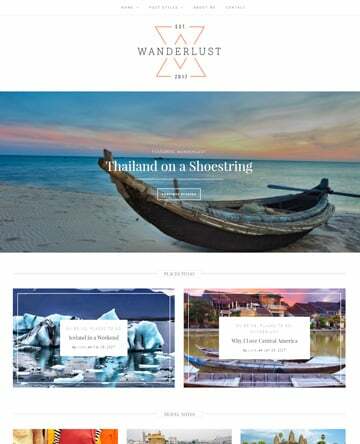 The image slider has a clean and beautiful layout and the ribbon header gives your website a unique look. Use large quotes and testimonials to build social proof and help visitors come to a buying decision. 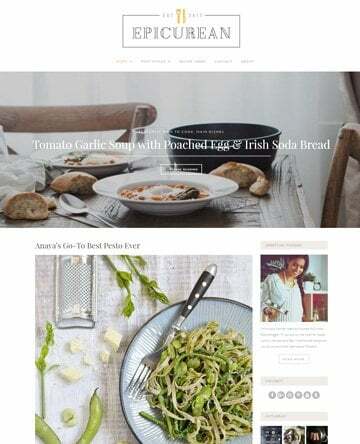 Along with video embedding, toggled content, and content sliders, the Convertible theme by Elegant Themes is a perfectly viable choice when building your landing page on WordPress. 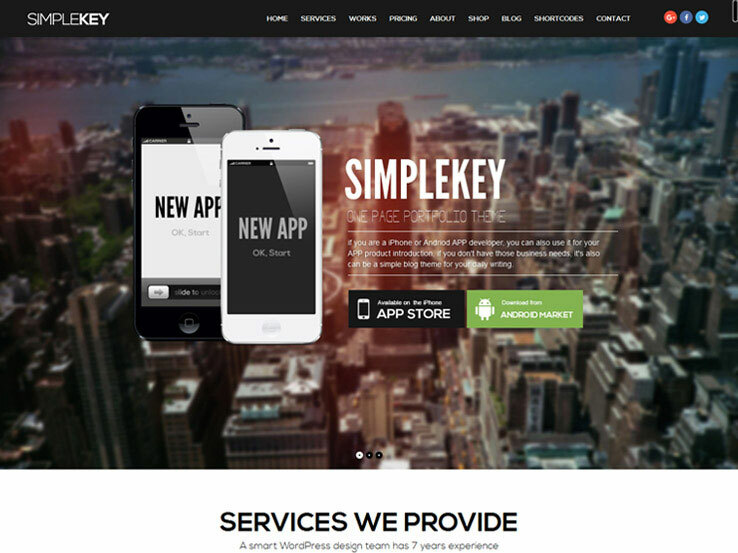 Simplekey provides a unique take on the one-page landing page theme since it offers a smooth scrolling effect, which is not always the case with landing page themes. You can choose from unlimited colors and backgrounds to incorporate your own branding and use different shortcodes to add elements without the need to touch a single line of code. The responsive design is an essential feature nowadays when more and more people are viewing web content on their mobile devices. The best part of the Simplekey theme is that it includes two premium plugins: Visual Composer and Revolution Slider. The Visual Composer plugin is a drag-and-drop editor which assists developers who want to speed up the client site creation process. It also helps out those who don’t have any development experience since you can build a professional looking site with a few clicks. The Slider Revolution plugin provides a beautiful slider with animations, overlaying text, buttons, and plenty of other features to improve your landing pages. LandingPage by Templatic has a wide range of features that allow you to create a stylish and useful landing page within seconds. This is one of the more colorful solutions you’ll see on the market since it has an unlimited amount of colors to choose from and they all look bright and appealing. The theme is completely responsive and looks great on mobile devices like tablets and phones. It’s also focused on a single page to put the main focus on the most important content. 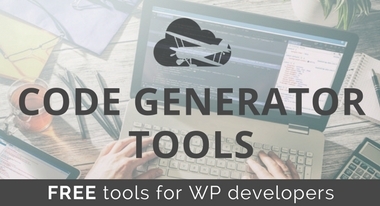 Some of the key features are managed in the WordPress backend where you can easily customize your homepage and access other customization options. Sell products, whether digital or physical, through your own online store, since the LandingPage theme supports the WooCommerce plugin. Use the portfolio management module for showing off your best work to past clients while also creating beautiful galleries. Automatic updates are provided with the theme and you can expand your reach to a global audience with the multilingual features. Mega-menu support allows you to add a number of pages and categories to your navigation without overwhelming your visitors. You can also use a wide variety of shortcodes to add anything from buttons to tabs without the need for coding knowledge. The Drone theme is a theme by the folks at ZigZagPress and it presents a beautiful way to show off your product to potential clients. This is a minimalist theme with clean typography and plenty of white space for putting the focus on your best content. The theme allows you to easily embed a video on your landing page to stand out from the competition. The homepage makes use of different sections to showcase your content and you can even include a robust, filterable portfolio which makes it easy for potential clients to find the work relevant to their needs. The responsive Drone theme runs on the Genesis Framework, which opens up all sorts of customization options. 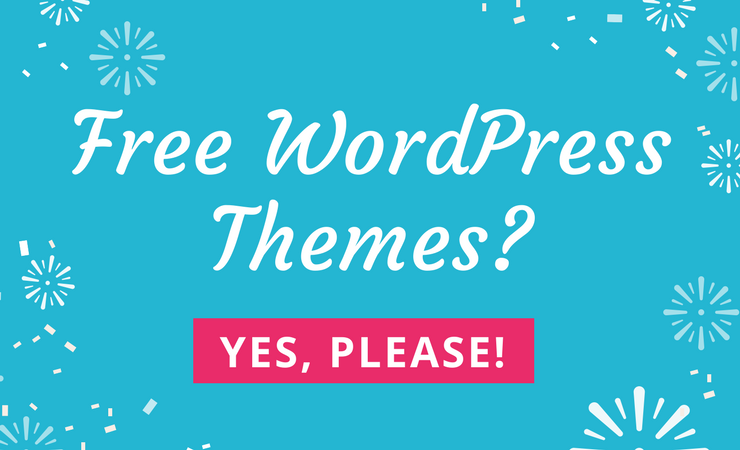 It also means that you can safely customize any aspect of the theme without the fear of losing the changes when the theme updates. Localization features are also included with the Drone theme, allowing you to easily create a multilingual website or translate it to a different language. 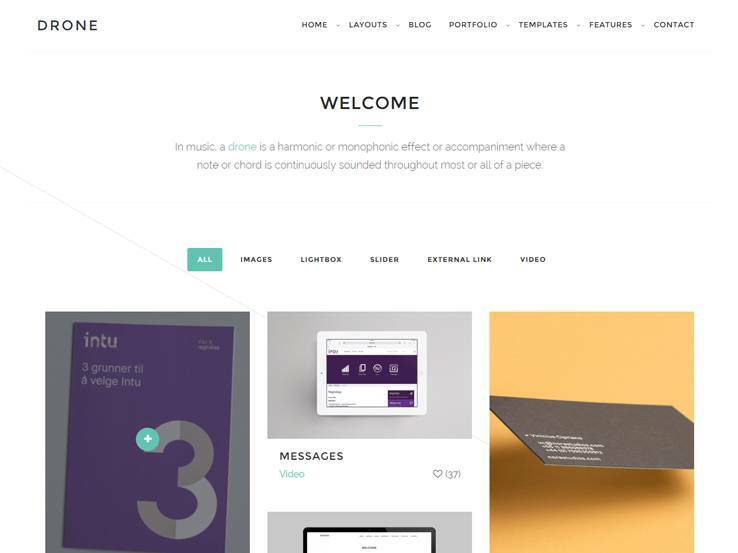 Overall, the Drone theme is a beautiful theme, with elegant sidebars, widgets to play around with, and plenty of other features for strengthening your landing page. 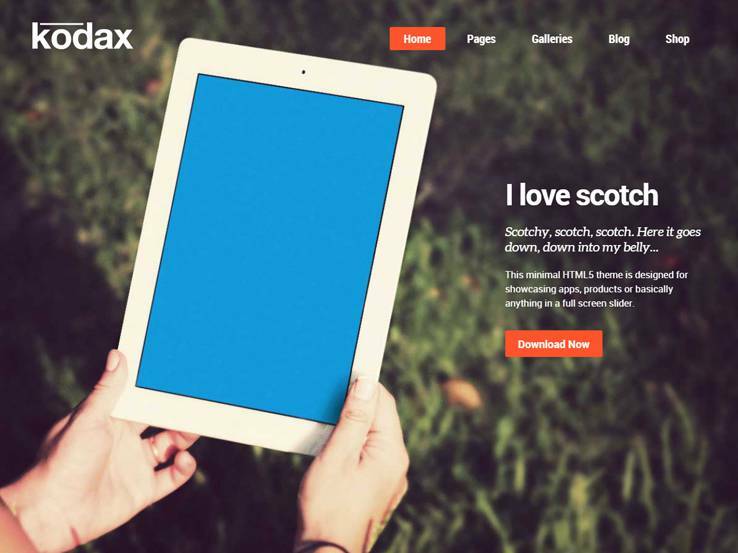 The Kodax WordPress theme is a full-screen landing page, which is great for showcasing products. The responsive design looks great on any screen size. The easy admin panel has plenty of customization options and font choices. The theme includes three advanced plugins and four widgets which make it even easier to set up your website. Over 10 different page templates and several galleries are included with the Kodax WordPress theme, allowing you to upload large galleries and create pages that are sure to capture the attention of your visitors. You can also embed media such as a video from Youtube which is a great way to introduce your product and maximize the conversion rates. The theme also includes various shortcodes which allow you to add anything from buttons to columns without the need to install a third-party plugin. The demo content helps you get up and running in a matter of minutes while the WooCommerce support gives you the ability to create a full online store. Along with custom CSS styles and translation tools, the Kodax theme is a solid choice.